Berries with clotted cream and honeycomb hash, and kites! We recently spent four days in Dorset near Lyme Regis. I didn’t know the county well and now I know that it will be a place to revisit again and again. It is stunning. The varied coast line with red pebbled beaches, bright chalk white cliffs, turquoise and green water and fossils is beautiful. Away from the coast are pretty little villages with thatched roofed cottages and undulating hills broken up with hedgerows delineating the fields. Everywhere we looked there was something to make us pause to take it in. We walked up Golden Cap, visited Lulworth Cove and Studland and went to a kite festival on Eggardon Hill. This was where we made one of the best foodie discoveries of our trip: Purbeck ice-cream. I have lived in Italy twice and love Italian gelato but I think, yes, I really do think that Purbeck ice-cream might be better! This may cause some wild hand gestures and tuts from Italian friends. The flavours were typically British: berries with clotted cream, honeycomb hash, stem ginger and more. The salted caramel actually had little crunchy bits of hard caramel in it, it was so good! One of my favourite flavours of gelato is pistachio and there wasn’t a pistachio to make a true comparison with Italian ice-cream to but, seriously, this creamy goodness was amazing! We stayed in the beautiful village of Whitchurch Canonicorum in a gorgeous little thatched cottage with alpacas in the field behind it. Find it here. I am a huge pastry fan and crème pâtissière/ custard/ clotted cream/ any type of cream fan. So éclairs are a pretty satisfying combination for me. 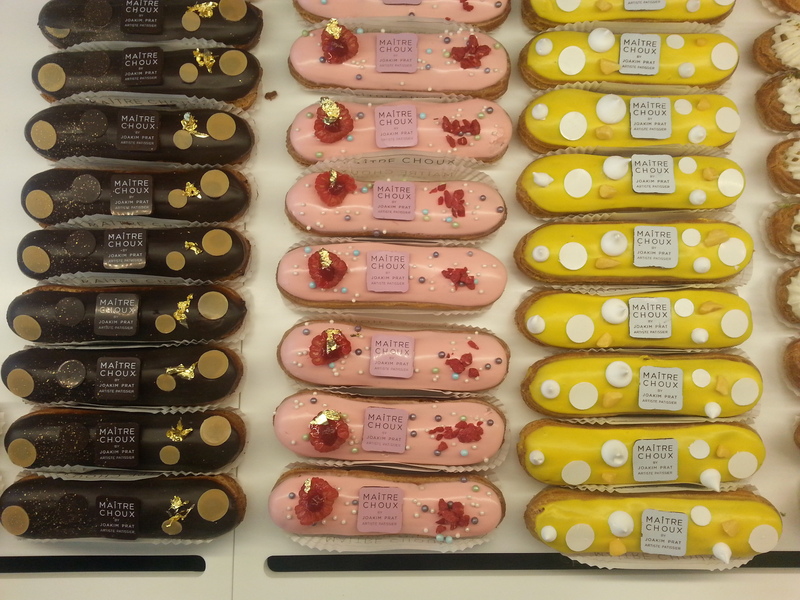 I recently started seeing press about beautifully colourful and delicately designed éclairs that were reinventing this classic and had to find out more. My brief research showed that there was a new éclair joint in South Kensington and the website alone made my heart rate increase! It is almost like a fashion website with the éclairs photographed at every angle to make sure that you are fully informed about the height, width, depth, external and interior decoration of these scrumptious desserts. Maître Choux is a small new pâtisserie created by top pastry chef Joakim Prat. The following Saturday we headed down on an éclair mission. 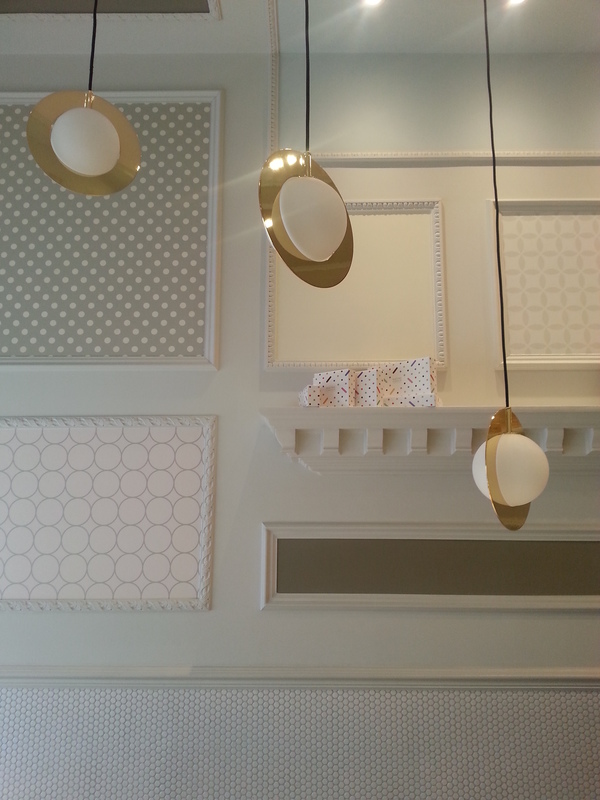 The shop is a beautifully designed small space with panelling and Lee Broom lights suspended like jewellery. The window alone makes everyone stop in their stride as there is a bounty of colours and flavours on display with deliciously delicate decorations on top. This makes the simple decision of which éclair to try take at least ten minutes. Of course, the most sensible thing to do would be to buy ten to get a broad sense of the pastries! A group of us went so we all tried different ones: pistachio, coffee, chocolate, and yuzu and lemon. All delicious! We had coffee (Monmouth) which came with chouquettes – delicious balls of choux pastry coated with chunky pieces of sugar. Some éclairs out there are too dense in general with heavy dough and an over generous filling of thick cream. I think they should be a puff of extravagance! Crisp pastry soothed with silky cream. These were perfect and the flavours were superb. Maître Choux’s flavours vary from salted butter and caramel, dark multi-origin chocolate, Tahitian vanilla and pecan, to orange and saffron. Plus the flavours change so multiple trips are an absolute necessity. Every time I go to an exhibition in South Ken I will be sure to stop by to check on these deliciously indulgent éclairs. In fact, I’ll see if I even make it to any exhibitions! When a recipe’s first instruction is to pour 100ml golden syrup into the bottom of a cake tin my sweet-tooth’s knee-jerk reaction is “Do it! Make it! Do it! Make it!”. Naturally I did and it was delicious!! This is a recipe by Lucas Hollweg from the Waitrose magazine, February 2014. I often pull out his recipes from the seasonal section and finally a year a few months later I have made this pudding. It is really easy and only requires 20 minutes’ preparation and 35 minutes in the oven: perfect for a laid-back Sunday afternoon. I have altered the ingredients slightly from the original recipe as I didn’t quite have everything so instead of light brown sugar I used dark brown (my favourite!) and instead of ground ginger I used allspice. 1. Heat the oven to 180C, 170C (fan). 2. Grease the cake tin with butter. 3. Pour 100g golden syrup into the cake tin and place the rhubarb pieces on top, packed tightly together. 4. Scatter half the orange zest over it. 5. Beat the butter, sugar, remaining syrup, remaining zest, ground allspice and cinnamon together. 6. Beat one egg in at a time with 25g of ground almonds. 7. Fold the flour in, then spoon the mixture onto the rhubarb pieces and smooth it so it is evenly spread. 8. Bake in the oven for 30-35 minutes. It is ready when a fork comes out of the batter clean. 9. Remove it from the oven and leave it to stand for 15 minutes. Carefully turn it onto a plate and eat it with cream, ice-cream or crème fraîche. It is also delicious and very moist on its own. Last Saturday, passing through Kings Cross on the way to St Albans for an outing, we came across the Real Food Market in the square outside the now amazing station (I love how it has been revamped, it is now a pleasure to walk around there!). It was a wonderful surprise and the most wonderful of all was the stall Bad Brownie. It is a stall with about 8 or so types of brownies with flavours varying from triple chocolate and Bakewell to bacon and maple syrup. We bought the salted caramel (anything with this name tag is impossible to resist) and the peanut butter which had a kind of peanut brittle on top – so so awfully bad. They were amazing! I was passing through Kings Cross again today and ran up the stairs from the underground fuelled by the thought of these brownies only to find an empty square. Humph. The Real Food Market is not on every Saturday. No bad brownie today. Bad Brownie is however to be found at various markets in London on various days. Find out more on their website by clicking here. Sometimes I have a deep strong urge to have biscuits. I don’t usually have packets in the flat so it inevitably leads to baking my own. Shortbread is one of my go-to recipes as it is easy and always delicious. You can alter the recipe too by adding bits like nuts, chocolate, seeds, and so on, as it is a good base. You can also use caster sugar or icing sugar to get a slightly crumblier texture with the former than the latter. However, this is if you aren’t staunchly conservative about how shortbread should be made, i.e. traditionally. I once made”disco ball shortbread” by adding silver sugar balls which was quite fun and silly (picture at the end) . This recipe takes 15 minutes to prepare and 15 minutes to bake so from urge to satisfaction can be as little as 30 minutes! 2. Roast the walnuts in the oven for 5 minutes, remove and set aside. 3. Beat the softened butter with a wooden spoon until it is really soft and smooth. 4. Add the icing sugar, dessert spoon at a time, and mix it in until it is blended well with the butter. 5. Add the half teaspoon of vanilla extract and mix that in well. 6. Add the flour and blend it with the buttery mixture, adding the nuts as you mix. 7. Take pieces of the dough, around the size of a ping pong ball, and flatten them into circles at about a centimetre thickness. 8. Place them on a greaseproof lined baking tray, not too close together, and bake for 15 minutes in the preheated oven. Turn the trays around half way through so the shortbreads bake evenly. 9. Once the shortbreads are lightly golden, remove them from the oven and allow to cool. 10. 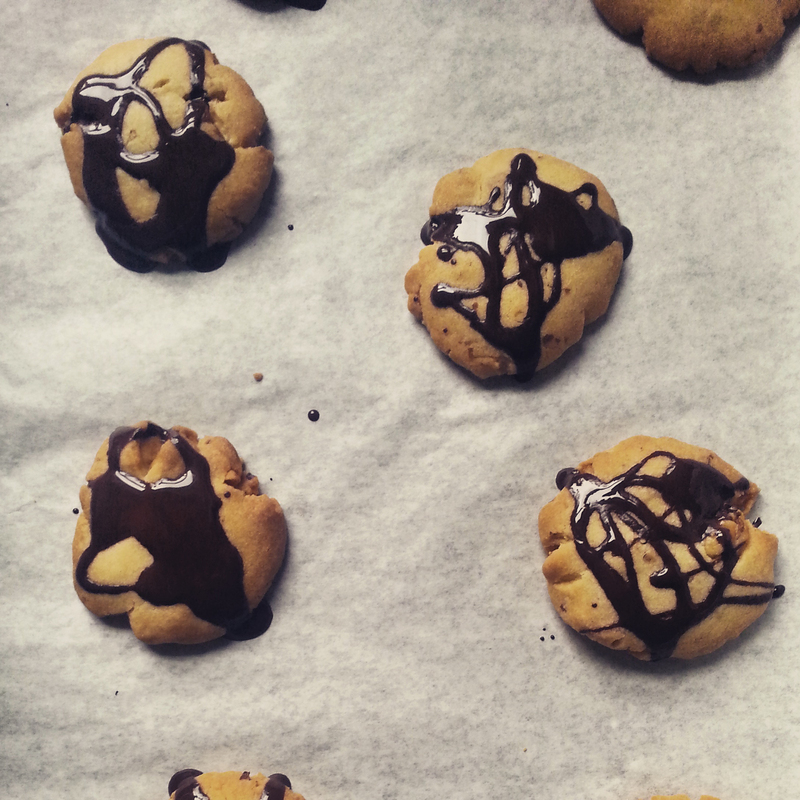 Melt the chocolate over a gentle heat and drizzle it over the shortbreads and voila, they are ready to satisfy the urge! I was given Dan Lepard’s “Short and Sweet” for my birthday a couple of years ago and I love it. It is full of baking techniques from making breads to tarts to éclairs. I have been making Dan Lepard’s recipes for years as he writes baking columns for papers and every recipe always sounds and looks scrumptious! I made his Raspberry Ripple Tart recipe for dessert when friends came over for dinner. Instead of serving little ones I made one large one with a huge swirl of raspberry through the custard. I also made several small ones (pictured) for dessert the next day – always necessary! The recipe is relatively simple and definitely a crowd-pleaser. The raspberry ripple is simply raspberries crushed with sugar so if you don’t have time to make the pastry you could buy shortcrust pastry and just make the custard. If you do have time though it is worth the effort. This is a good dessert to make in advance as the pastry needs to be chilled and the custard needs to cool as well so it will need about an hour and a half to make overall. 1. First, make the pastry by putting the flour, sugar and salt in a bowl. 2. Cut the butter into little pieces, put them in the bowl with the flour, sugar and salt and rub the butter into these ingredients until it has blended with them. 3. Stir the egg yolks with the water, pour this into the bowl with the flour mixture and combine it to form a soft and smooth paste. 4. Shape the dough into a block, wrap in cling film and put in the fridge for 30 minutes before using it. 5. Heat the oven to 160C/ 180C fan. 6. Once the pastry has chilled, take it out of the fridge and roll it out thinly. Sprinkle some flour on the surface and rolling pin to avoid it sticking. 7. If you are making a large tart, line a greased tart tin with the pastry and, if you are making small tarts, cut circles of pastry and line each pocket of a greased muffin tray with the pastry. 8. Put a large piece of baking paper on the pastry (if you’re using one large tin) or muffin cases on the pastry (if you’re using a muffin tray), and fill them half-way with baking beans or dry rice. 9. Bake the pastry for 20-25 minutes until dry and golden. Remove from the oven, leave to cool and then remove the greaseproof paper or muffin cases with the baking beans or rice. 10. Whilst the pastry is cooling, you can make the custard. Start by heating the milk with the vanilla pod on a medium heat. 11. In a bowl whisk the sugar, flour and egg whites until smooth. Beat the hot milk into this mixture in the bowl, then pour it all back into the pan and heat until boiling whisking the whole time. 12. Remove the pan from the heat, remove the vanilla pod and cover the pan with a plate (to stop a skin forming). Leave until the custard is cold. 13. Whilst the custard is cooling crush the raspberries with the caster sugar. 14. When the custard is cold, whip the cream until soft peaks form and fold it gently through the custard. 15. Put the pastry case/s on a plate or cake stand and spoon the custard into the pastry case/s and swirl the raspberries through it. If that isn’t a tempting dessert photo, I don’t know what is! Last weekend I attempted my first coffee Paris-Brest (a recipe from “Short and Sweet”) which are small choux pastries cut in half with coffee custard in the centre and flaked almonds and caramel on top. The choux pastry puffed up a lot (as it does in general due to the water content) which meant that they turned out nothing like the photo in the book! I need to attempt these again but I can certainly say that coffee custard and choux pastry are sublime together! Protecting the figs from birds; occasionally they got to one. Whilst picking figs you’d find a plump luscious one and go to pluck it only to find that the other side had a big chunk removed showing its pinky purple juicy flesh. I love figs. I am a fig pig! In August I spent another fabulous 10 days in Provence relaxing, eating and drinking extremely well, visiting markets and going to the city wide photography festival in Arles. Last year I blogged about my stay here. This is quite a retro blog post as I was in Provence in August and it is now December! Looking at these photos again is certainly warming me up during this crisp and chilly month. We went to St Quentin la Poterie which is a beautiful small town famous for the potters whose studios are dotted about the winding streets. It also has a wonderful market. The market isn’t postcard pretty as it is set up in a car park but the produce is fantastic. We went there to pick up bread, cheese, pastes for aperitif, fresh vegetables and fruit and even handmade peppermint, geranium and verbena soaps. The potters’ studios are great and varied, with some allowing you to see the potters at work, so we started a little collection of crockery – to put the bread, cheese, fresh veg, etc on of course! Every morning at the house we collected figs from the tree. One morning we collected an astonishing 41 figs! The ones that weren’t reserved for jam making only lasted until the next day’s breakfast. They were temptingly delicious! I loved the routine during the holiday. It went something like this: wake-up, breakfast on the terrace, relax in a hammock, have aperitif by the pool then lunch in the garden, relax again, have aperitif then supper and then relax. Such a strenuous time! Eating outdoors was one of the things I loved so much. Working indoors (as most people do) means that the simple act of being outside is such a novelty (sadly) even though it is so normal. Everything is better when done outdoors in beautiful weather: drinking a glass of wine, cutting into a fresh baguette, eating a fig. It isn’t even necessary to follow any recipes there as the local produce is so good that all you need to do is eat it in different combinations. I think the photos say it all. There is always room for cheese! St Quentin la Poterie with the beautiful tiled detail running down the centre of the lanes. Vegan for Lent – I loved it! Enter your email address to subscribe to this blog and receive new recipes and delicious posts by email.